On Friday, May 19, the Milwaukee County Zoo will hold an event to draw attention to Endangered Species Day. One of the Zoo’s endangered animals will "vanish" from its exhibit, illustrating the very real threat of extinction. 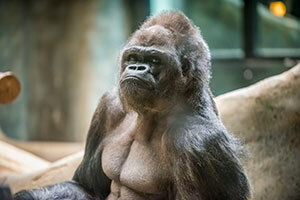 This year, the Zoo’s gorillas vanish for the day to demonstrate the need to save wild animals and their habitats. The gorillas’ outdoor exhibit will be completely covered, not allowing visitors to see them, and simulating a world without these amazing great apes. Western lowland gorillas are critically endangered due to disease, habitat loss and illegal hunting—which occurs regularly despite anti-poaching efforts. WHAT: Members of the Association of Zoos and Aquariums (AZA), including the Milwaukee County Zoo, are coming together in various ways to help the public understand what our world would be like without the opportunity to see, learn from and connect with these incredible animal species. The AZA SAFE (Saving Animals From Extinction) event raises awareness of the work that AZA-member zoos and aquariums do to save endangered species from extinction as well as highlights the role of the public in saving animals. The Milwaukee County Zoo is a member of the Founders Circle of AZA SAFE, and is proud to support this initiative at the “Conservator” level. WHO: Media are invited to visit the Zoo on May 19 and see firsthand the Milwaukee County Zoo’s involvement in the mission to save endangered species, how we showcase the importance of these animals to the public and the need for their populations to remain for future generations. Now in its third year, the national program of AZA SAFE: Saving Animals From Extinction is a collaboration of AZA-accredited zoos and aquariums to highlight conservation science and wildlife research to 180 million annual visitors. Again this year, the program features 10 species: shark, African penguin, Asian elephant, black rhino, cheetah, gorilla, sea turtle, vaquita, Western pond turtle and whooping crane. The Milwaukee County Zoo currently houses five of these species (shown in bold). 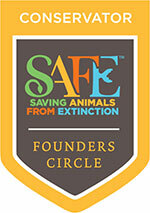 The SAFE initiative builds on existing conservation efforts by the community of 229 AZA-accredited zoos and aquariums. SAFE harnesses the collective power and infrastructure—along with additional funding and resources—to target specific endangered species and save them from extinction by restoring healthy wild populations. Through SAFE, the AZA and its members convene scientists and global stakeholders to identify factors threatening species, work to develop Conservation Action Plans, collect new resources and engage the public. As with last year, the AZA will continue to focus on fundraising and implementation of the plans for several of the 10 signatures species, including African penguins, cheetahs, Western pond turtles and sharks. There are an estimated two to eight million species of animals on the planet. Many could become extinct by the end of the 21st Century, as a result of many factors such as habitat loss and fragmentation, climate change and the exotic animal trade. Zoos are the last hope for many animals on the verge of extinction—but zoos shelter only a fraction of the world’s species. How will you help preserve animals for future generations? When: Friday, May 19 from 10 a.m. to 2 p.m.
For additional information, contact the Zoo’s Marketing and Communications Department at 414.256.5466 or visit milwaukeezoo.org. Be sure to follow the online conversation live on May 19 via #savingspecies. The AZA SAFE Program harnesses the collective expertise within our accredited zoos and aquariums and leverages their massive audiences to save critical species. At the same time, SAFE is building capacity to increase direct conservation spending, as well as our members’ impact on saving animals through work in the field, in our zoos and aquariums, and through public engagement. To learn more, visit AZAsavingspecies.org.